Kou is a 22-year-old man who self-proclaims to be part of the 'elite.' 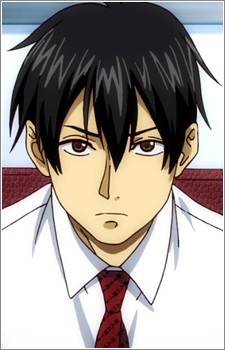 He is the first son of the Ichinomiya family, which makes him the heir of the family company. While others of his age are just your regular, everyday college students, he has already bought his own luxurious apartment, and claims to have made over 8 million yen within his short life. From the day Kou was born, he has been taught not to be indebted to anyone. Therefore, his whole life has been obsessed by it. From wearing the necktie that bears his family's 'motto', to coming up with scenarios how to avoid unnecessary 'charity' from others. But his life quickly changes when he is saved by Nino. In order to pay off his 'debt' to her, he fulfills her wishes by becoming her boyfriend and moving in with her, thus leaving his carefree and rich life behind him. When he gets nervous or stressed out, Kou suffers from a bad case of asthma, just like the other members of his family. Like the rest of the group, the mayor also nicknames him, which in his case is 'Riku.' Riku is an abbreviaton of 'recruit,' referring to a newly recruited businessman.